A few years ago we were installing a plaster wall finish for an interior design project by the venerable Jeffrey Bilhuber and fell in love with another wall- a fluted plaster stunner. It was the first time we had seen a fluted plaster wall, columns sure, but on a flat wall in a contemporary setting, never. We saw that flat, previously nondescript walls become architectural design statements when fluted. Tactilely inviting, optically captivating, and a bit mysterious, at a distance fluted walls could be mistaken for stripes, their trendy, two dimensional cousin, but fluted walls have a visual depth, a play of light and shadow, and a historical reference all their own. 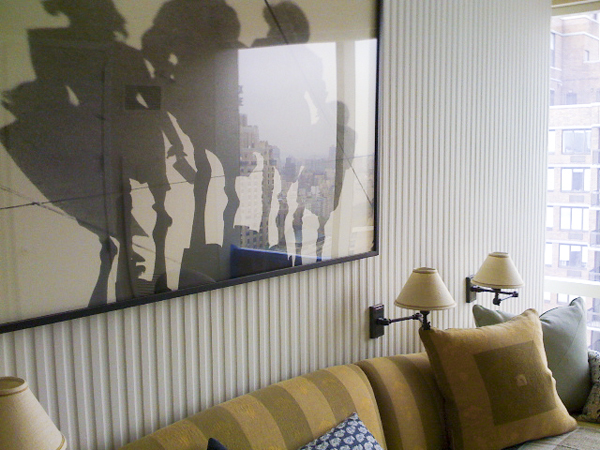 The first fluted plaster wall finish we’d ever seen in a New York living room designed by Jeffrey Bilhuber. Photo by SuperStrata. Up close and personal, the unfinished plaster brings a subtle texture. The texture and depth of the finish is further enhanced as the light plays off the ridges of the fluting. Photo by SuperStrata. The living room by Miles Redd that sent us on our quest for fluting! The walls and ceiling received a continuous surface finish created by applying plaster to the walls and fluting it while still wet with specially made tools. Photo by James Merrell via House Beautiful. The light, ruffled aqua drapes lend a delicate air to this sitting area designed by Miles Redd. Notice the fluted wall treatment does not continue over the ceiling, but rather meets it in a soft caress. Photo by James Merrell via House Beautiful. A fluted reading corner by Miles Redd. Photo by James Merrell via House Beautiful. The fluting on the ceiling, seen here reflected in the mirrored wall, adds texture and movement. Interior design by Miles Redd. Photo by James Merrell via House Beautiful. We love this warm and sensual fluted walnut paneling in an interior designed by Fox-Nahem. Photo by Elizabeth Felicella via Fox-Nahem. Photo by Elizabeth Felicella via Fox-Nahem. A Chicago dining room by Parisian designer Jean-Louis Deniot with fantastic plaster fluted walls by the Luczak Brothers. Can’t you just see these walls perfectly juxtaposed with minimal and mid-century design as well? Photo by Miguel Flores-Vianna via Architectural Digest. This elegant, rustic room by McAlpine Tankersly gets the traditional gone modern treatment in the form of a fluted half wall. Photo via Limestone and Boxwoods. Maybe not such a new idea? An illustration of an Art-Deco era grand “stair hall” designed by Émile-Jacques Ruhlmann with a fluted wall on the ground level. Image via Bradbury & Bradbury.